It’s always a nice feeling to know that we’ve been able to fulfil someone’s dream. A hand forged wrought iron gate made to match an antique New Orlean’s wrought iron baluster was the final piece one customer needed to complete his ‘French Quarter’ courtyard. Not quite what you're looking for? Want to see more designs? 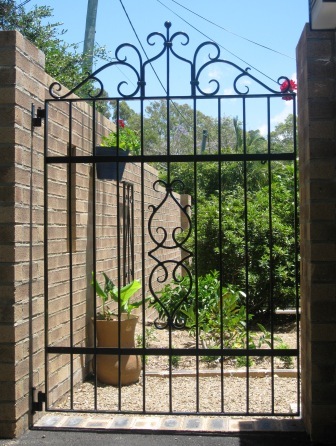 Click for more ‘wrought iron gates’ gallery or make a time to meet with us and design your own unique gate. 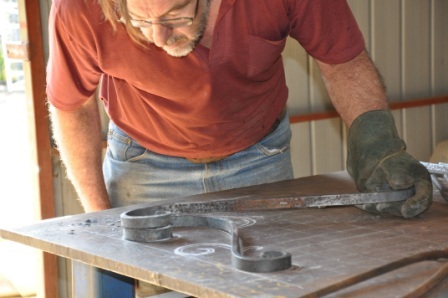 A few months ago a gentleman from Queensland approached us to see if we could make a gate to match a piece of antique wrought iron he’d found on a trip to New Orleans. He intended to use his piece as a window feature in a courtyard wall and needed a gate to match, so wanted the design replicated in the centre of a gate. The customer made a tracing of the wrought iron and mailed it to us. It seemed a shame to has such a lovely piece in a relatively plain gate so I suggested that a lovely wrought iron top be designed to complement the ironwork. I ran a couple of drawings past our customer which he liked. After some minor tweaks to the design we had a concept he loved. 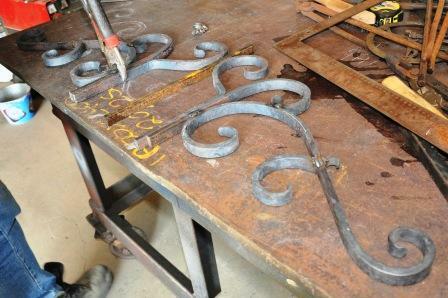 The first part of the project was to forge the wrought iron centrepiece which would then be set into the basic gate frame with vertical bars. The topper was going to be more complex and when completed was a piece of art in itself. 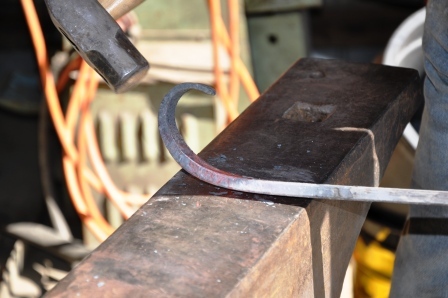 As other customers visited the workshop during the manufacturing process, they all commented on the lovely little gate. 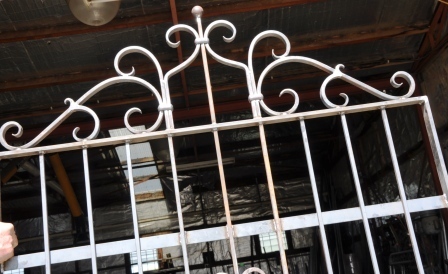 We probably could have sold another 2 or 3 of these wrought iron gates. It was beautiful. 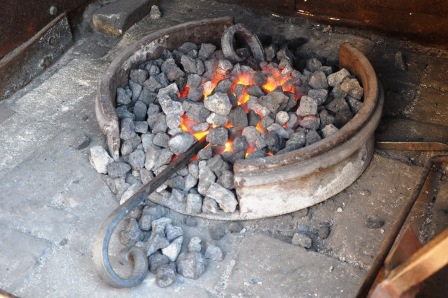 “We spent ages searching in person and on the web for someone who could produce a quality wrought iron gate in a traditional style at a fair price. We weren’t interested in cheap and shoddy but by the same token we also weren’t prepared to pay for underwriting someone’s over-expensive website, either. I liked the look and feel of Farmweld’s website straight away, because you could tell these were people who were passionate about what they were doing and proud of what they produced. 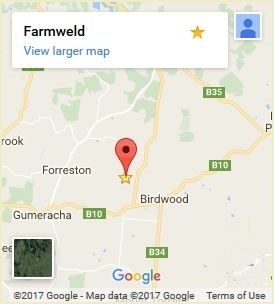 All our dealings with Tricia and Farmweld proved my first impressions were spot on. We asked Tricia if they could incorporate the same design into the centre of the gate and after a bit of emailing back and forth it came up a treat. 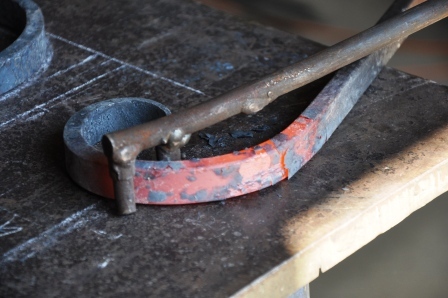 Hand forged blacksmithing may be more expensive than some of the machine made wrought iron on the market but it has a beauty that only a hand made product can have, and will certainly add value to these people’s real estate. 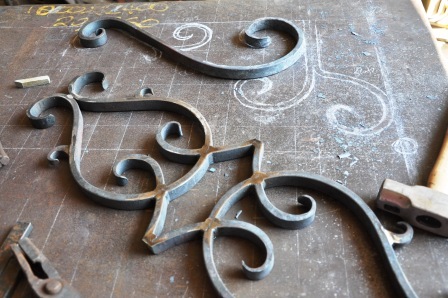 Posted in: Gates, Wrought Iron.